High digging forces and fast cycle times to help you get more done, faster. Quiet, spacious cab and smooth ergonomic controls, with integrated auxiliary and swing boom functions keep you comfortable and reduce operator fatigue. 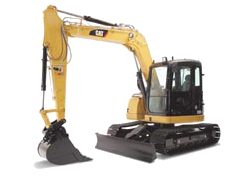 Pin-Grabber Coupler and quick disconnects enables the operator to change mini excavator attachments quickly. Auto idle, auto two-speed and a load sensing variable pump optimize fuel efficiency. A compact or standard radius tail swing with a swing or fixed boom option provides a good match to any jobsite.